An aggressive take on the classic work boot, the Speed & Strength Speed Shop Boots combine casual style with serious protection business. The boot itself is quite simply constructed with subtle branding and clean function. The chassis of the Speed Shop boot is made from synthetic leather and styled with zig-zag stitching as well as the Speed and Strength imprint across the sole. All of the standard armor is included, sporting internal toe and ankle reinforcements. In addition, the "Lockdown" adjusters use metal buckles to ensure a solid hold on your foot. To take them off, simply unbuckle the adjusters and use the side zipper to allow easy exit. 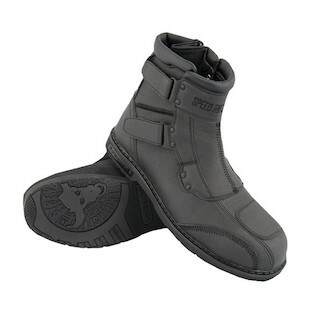 While not waterproof, the S&S Speed Shop Boots do come with an anti-slip rubber outsole. No shoe is left unturned with Speed and Strength. Whatever your style, wherever your riding takes you, there is always a Speed & Strength Boot to suit your fancy.